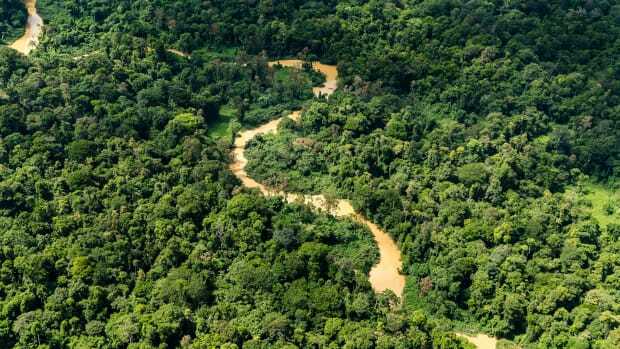 The Rio Pini Pini flowing out of Manu National Park in Peru. There&apos;s no doubt that animals play critical roles in maintaining healthy forests. In these species-rich ecosystems, birds and mammals—especially large ones—ingest seeds from all kinds of plants and, ahem, distribute them around the forest. If those seeds take root and grow, it closes the circle and the forest&apos;s diverse mix of plant life remains intact. 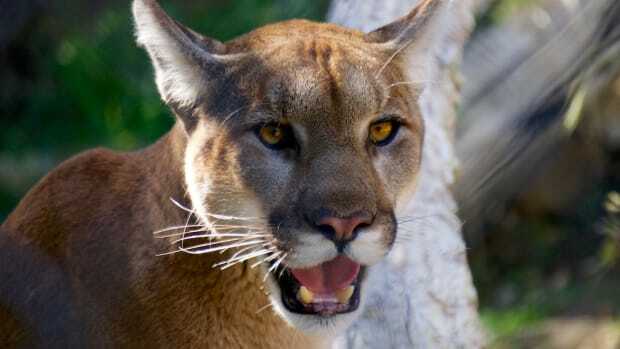 However, as large animals—the ones that humans are most likely to hunt and that are most affected by forest loss—disappear from the ecosystem the forest&apos;s plant biodiversity goes down. But why that happens hasn&apos;t been clear. To address this question, a team of scientists from Spain and Germany developed a mathematical model to test the effects of different variables on forest biodiversity, as well as how many seeds actually become seedlings. They reported their results in the journal Proceedings of the Royal Society B on May 31st, demonstrating that the relationship between the sizes of birds and seeds can help explain why large animals can play an outsized role in maintaining a healthy ecosystem. In this case, the team, led by doctoral student and ecologist Isabel Donoso of the University of Oviedo in Spain, looked at large frugivorous, or fruit-eating, birds. "It has been suggested that big frugivores are important, but why?" Donoso said in an interview. 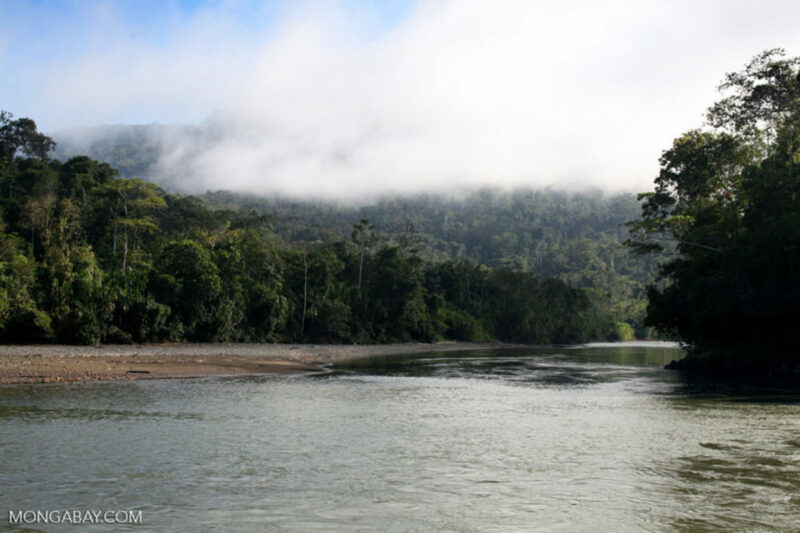 Field data collected by Donoso&apos;s co-authors in Peru&apos;s Manu Biosphere Reserve, which stretches from the cloud forests of the Andes to the lowlands of the Amazon, underpinned their model. But unlike the actual forest, the model made it easier for the scientists to tinker with different variables. "It&apos;s really difficult to get this data from the field," Donoso explained. "It&apos;s easy to see the first interaction [between the birds and the seeds] but not the demographic effects. "You can see which bird eats which fruit," she added, but not how much they eat, where they defecate or if the fruit&apos;s seeds survive. With the model, they could follow the virtual seed from the time it&apos;s ingested to when it lands back on the ground and potentially germinates. The seed&apos;s size can determine where it&apos;s taken and by what animal. In a forest ecosystem, smaller seeds have a better chance of being eaten and distributed to other parts of the forest because, in general, both small and large birds will eat them. But when a plant invests in producing larger seeds, the spectrum of bird species that will go after them narrows. This "size matching" can pay off: Larger animals are typically better seed spreaders, transporting them further afield with more of them germinating into plants. Bigger seeds take more energy to make, so plants don&apos;t produce as many. But that&apos;s also a way of enticing birds to feast as if the seeds are saying, "I&apos;m less abundant, but I&apos;m better," Donoso explained. 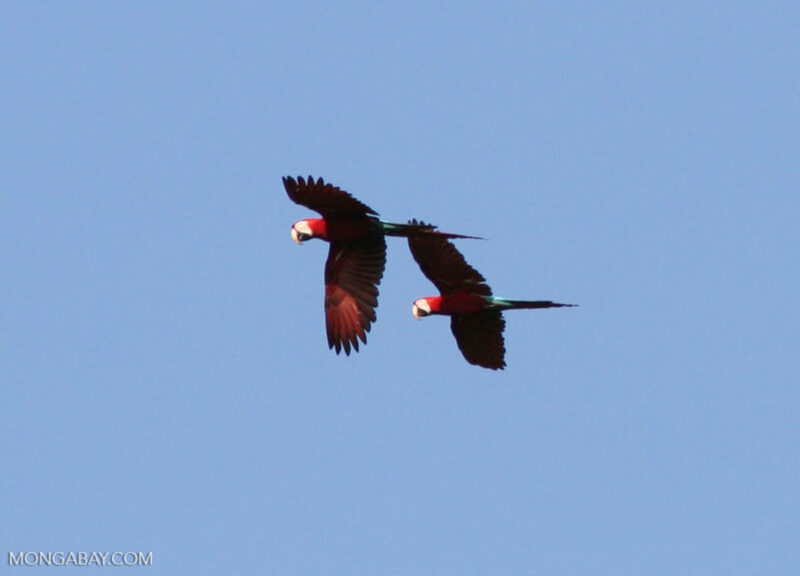 Red-and-green macaws in flight in Manu National Park, Peru. Evolutionarily speaking, however, this quality-over-quantity tradeoff is a bit of a gamble, and the strategy doesn&apos;t account for the impact that we humans have on the forest environment. 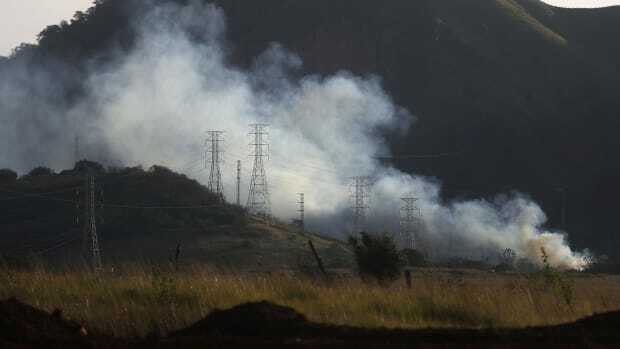 "Big birds or big mammals are usually the ones that are more impacted by humans because of deforestation," Donoso said. As large birds disappear from the ecosystem in the team&apos;s model, fewer seedlings from a smaller array of plant species survive. What&apos;s more, this effect is more pronounced and happens more rapidly if larger birds are among the animals forced out of the ecosystem. This deeper understanding of big animals&apos; critical importance should help guide future moves to protect tropical forests, Donoso said. 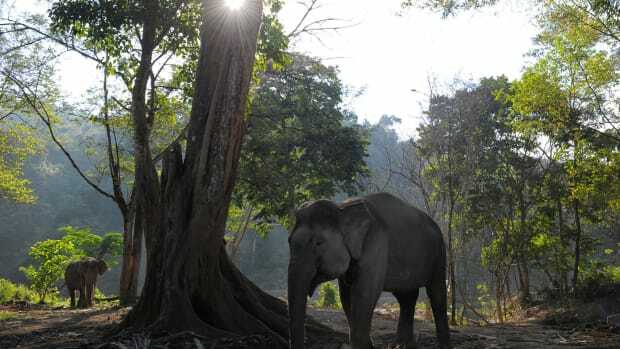 "If we seek to avoid—and halt—the decay of ecosystem functions, especially in the tropics, we urgently need conservation measures that target large animal species," she said in a statement. 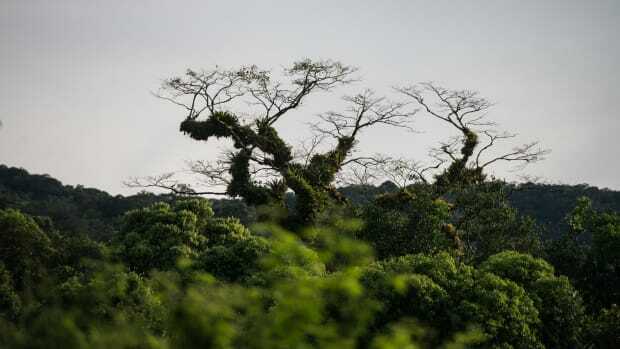 "Otherwise the lush diversity of tropical forests, as we know it, could soon be a shadow from the past." Deforestation increased almost 60 percent last year, with the forest losing over 29,000 hectares, a new report says. 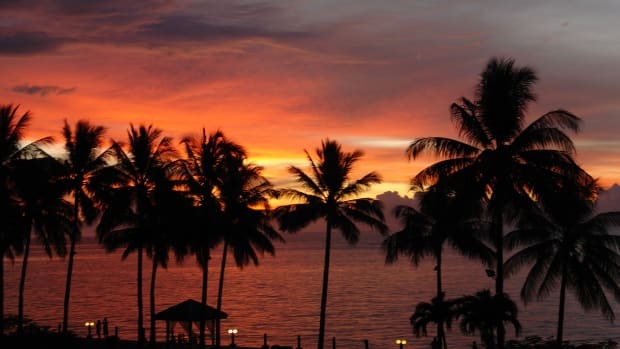 Plants and animals in the tropics are threatened by a range of issues, warn researchers writing in the journal Nature.